Synopsis: Get rid of the exterior chrome on your MINI. If you're not a fan of the exterior chrome on your MINI we can help you systematically get rid of it, replace it or simply cover it up with something stealthy black. 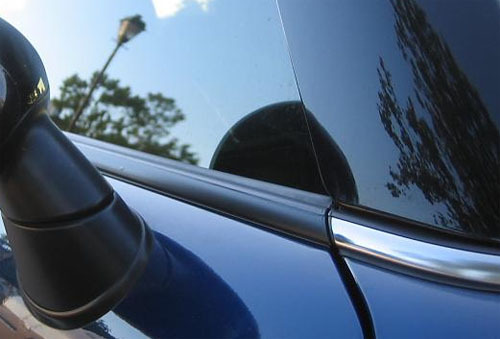 We offer a simple solution to get rid of some of the chrome by applying this blackout tape to the chrome beltline where the glass meets the bodywork. The image shows the blackout tape applied on the door panel and the original on the right. It's affordable, easy to apply and makes a world of difference- especially for those that love the blacked out look. Check out the blackout beltline kit for your MINI here....we also have RED for those want to add a bit of spice to their life.